Just the other day, we showed you some photographs of the BlackBerry Touch. Code named the Monaco or the Monza for the CDMA and GSM models respectively, the handset is next in a series of 'Berry models to take on the Apple iPhone (BlackBerry Storm, BlackBerry Torch 9800), RIM is hoping for better results with the new model. As you might recall, the BlackBerry Storm launched half-baked after a huge buzz while the Torch received lukewarm reviews from users. While viewing pictures is nice, looking at video is better. Extracted from a recently leaked version of BlackBerry OS 6.0 (6.1.0.44 to be exact) is a number of video tutorials for the BlackBerry Touch. The question is whether or not RIM can ever get current Apple or Android users to make the switch to BlackBerry. While the Torch 9800 might have been successful in keeping 'Berry users from jumping ship, RIM needs to come up with something spectacular to entice those using other platforms to at least give BlackBerry a try. Is the BlackBerry Touch that phone? can I see the real phone in action and not a computer simulation, Please. Until Black Berry releases QNX based smartphones, they will not make much headway in the consumer market. The will continue to do well in the enterprise segment because they are so entrenched, but OS 6.x will not make a dent in iOS or Android. No Dual Core, no LTE, no QNX means NO DEAL!!! 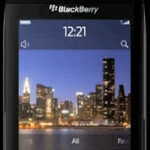 no it needs windows phone 7. that wud be perfect for bb. Think of it running on a torch... that wud be pretty nice--and it would give bb the "hip" they need. And honestly, the marketplace has about as many apps as "app world"
Best phone for Business. Kudos for RIM for making the black berry look slim, simple, and unique... unlike toy looking androids or fragile square iphone. No, the monaco will not be that phone. Too little too late guys, here's hoping for better luck on the playbook than in RIM's smartphone line. I would get this phone if it had a front facing camera, 4g Lte or wimax or hspa+ 21 mbps connectivity and flash player for better web browsing and since most likely it wont have any of those things i prolly wont be getting this bb , I just really hope I'm crossing my fingers because I love blackberries I'm hoping it does have all those things I mentioned above if it did I would.dump my bb bold 9700 and get this new blackberry. If people using htc, lg and samsung phones get all those feautures I mentioned above why can't us bb users get any of those things? BB/RIM may be starting to make some progress, but as @Senior and @jenny mentioned, they are still behind the feature set of the competition. The only thing keeping RIM viable on the high speed data connectivity issue is the general lack of high speed data service for most users. If users can't reliably make high speed data connections, the lack of that feature on the phone is not a deal-killer. Apple has managed to avoid having to provide a LTE modem in the iPhone until maybe even the iPhone 6.... But BB/RIM is not the Apple iPhone, so they are going to have to step up their game to stay relevant. Notice how the PlayBook is supposed to be released around Summer, 2011 with WiMax and LTE? There is a reason for that. BB/RIM need to be releasing phones with similar high data capability. MONACO??!! So did they think this name out at all? I laughed the first time I saw it. With such a latino culture merging in the US you think someone that spoke spanish for RIM would have said this was a dumb idea. Mo-Naco .... So I am hearing More Naco... Def: Naco (fmn. naca) is a pejorative word often used in Mexican Spanish to describe the bad-mannered and poorly educated people of lower social classes. It is also the union of the apocope of two Spanish words "nacido" (born) and "corriente" (ordinary): therefore na-co (lowborn or lowbred). Still don't see why need a touch screen on the BlackBerry Curve just looks stupid to me. Why a touch screen on the Motorola Pro??? It doesn't make since. A BlackBerry want-be! I'm going to stick with my Torch, which I went with for the physical keyboard. I'm a little afraid that a day will come when phone companies totally stop producing phones with physical keyboards. Agreed. I have the Style and before Curve 8350i both with good keyboards. I would hate to be forced to type on a piece of flipin' glass. I like the Torch with the vertical sliding keyboard and touchscreen, but I would hate the idea of having to rely on the screen fully for typing. My speed and accuracy would suffer horribly. I always enjoyed my BB Storm. I picked up the Fascinate from Verizon and they killer is the lack of support for the phone Verizon blames Samsung and Samsung blames Verizon for the lack of updates. I have two upgrades and I just may have to check this out, if and when Verizon may get it. root it and throw a custom rom on it! The hardware is pretty great, blackberry has always had great aesthetics, i just am not a fan of the OS personally.